Circus Maximus at Eastman Theater’s Kodak Hall Feb. 3, 2017! 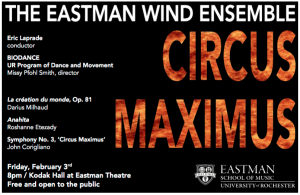 Join BIODANCE and the Eastman Wind Ensemble under the direction of Conductor Eric Laprade on Friday, Feb. 3, 2017 at 8pm for a FREE collaborative performance! With 18 musicians and 12 dancers, Darius Milhaud’s La creation du monde will come to life with a new interpretation of this seminal work. 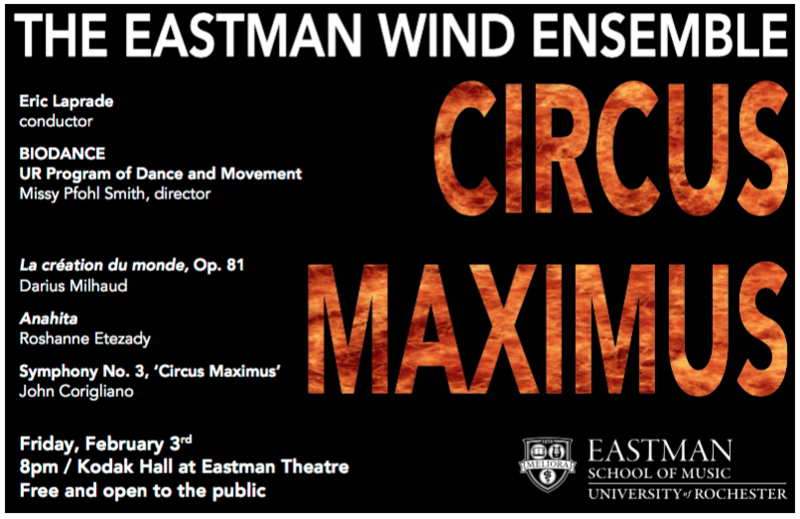 The piece will be repeated on Wed. Feb. 8 at 2pm in the new Eastman Wing, in EEW-415 on the 4th floor above the RPO Box Office. The Wed. performance will feature digital media projection by W. MICHELLE HARRIS that is not to be missed. Both shows are FREE and OPEN TO THE PUBLIC!